It just occurred to me that Advent is very short this year. Christmas Eve is the same as the Fourth Sunday of Advent! This makes me doubly happy that I am almost completely done with my Christmas shopping - I only have two more things to get! But it wasn't always so. I remember kneeling during each Sunday in Advent just shaking with anxiety because I didn't have anything even close to being complete! Christmas seemed like a big tangle of stress to me as a Mom! How did that happen? When I was growing up, Christmas seemed like a magical time of year! But a funny thing happened after I got married and had my first baby - it slowly occurred to me that Christmas didn't just happen! Someone was responsible for making that magic and now that magic maker was ME!! My mother became the object of even greater respect from that point on. How on earth did she do that for us every year for so long? I then entered the "I-dread-Christmas" time of my life! Every year it seemed that the weeks of Advent ticked off as a cruel reminder to me of all of the things that I did NOT have done. On top of taking care of the house, homeschooling the kids and even my part-time job, Christmas preparation seemed like one more thing to throw on top of my already precariously balanced life! One day, I heard a financial expert on the radio say that holiday expenditures should not be more than 1% of the household income. What if I put that same idea into the energy spent shopping for gifts and put 1% of my effort into it? And what if I spread that effort throughout the year instead of concentrating it into the last few weeks of the year? Once I started thinking about holiday shopping that way, I was able to make some big changes in the way I did my holiday shopping. Here are some tips that helped. Christmas prep starts almost immediately after the holidays. I started taking advantage of those after holiday sales on wrapping paper, tape, tags, and gift bags. This included my online shopping as well. Buying gifts became a year-round activity. If I saw a sale on something someone would like or need, I bought it and put it away for wrapping. This included shopping at tag sales, garage sales and estate sales! Some of my best gifts were not purchased from a store! This was true for online shopping as well. Ordered gifts came to the door and went right into the closet to await wrapping! I more than made up for my Amazon Prime subscription by taking advantage of the free shipping. How did I know when my Christmas shopping was done? When each young child had three gifts- because Baby Jesus only got three gifts for the first Christmas. Older children might only get one gift because their gifts usually cost more. My goal is to be done with my shopping by the first Sunday of Advent. By purchasing or making gifts all year, this is a very achievable goal. Shopping this way had some big advantages for my family. First of all, it got my children into the mindset of planning ahead and shopping for deals. When my high school students studied finance and home economics, they already had this practical life experience of planning ahead and saving money. Secondly, this type of holiday shopping through the year helped us make it through the holidays in a way that was more Christ- and home-centered with less outside distraction. 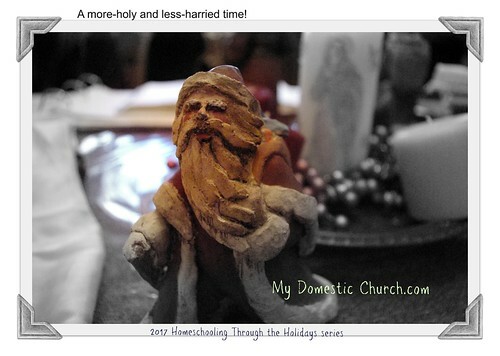 Finally, having finished our shopping before Advent, I didn't need to short-change our homeschool. There was still time to finish chapters in math, units in history and late fall science projects. There was even time to read some special things together in our homeschool literature. Now I'm not posting this to make anyone else feel guilty or stressed out! But maybe to encourage you to start shopping for next Christmas even during this Christmas if you can. Even if the budget won't allow for it now, start writing down the things you see and the vendors and stores you like anyway. It doesn't cost anything to keep a record. Then when the Christmas season ends (which to most merchants is December 26!) you can start taking advantage of those sales! In the end, by keeping an eye out for special gifts all year round in anticipation of Christmas has its own kind of magic. Since I was able to really take my time with each gift, I found greater enjoyment in watching everyone open their gifts. For me, having all of the gifts done allowed me to participate more fully in church functions and enjoy the season of Advent to its fullest.